how you can help make October 15 a successful day for peace! The march leaves the Park Blocks at Salmon St at 1:30 PM, heads east to SW 1st (World Trade Center), south to Main St, then west toward Broadway. The march will stop at SW 4th and Main to address Occupy Portland. Once at Broadway, it will head south to Clay, west to 12th, and then north to Main St and the First Unitarian Church. The forum speakers will be PSU sociology professor Veronica Dujon, Lewis and Clark College economics professor Martin Hart-Landsberg, and executive director of the national Bill of Rights Defense Committee Shahid Buttar. Following their presentations, there will be a Q&A session. 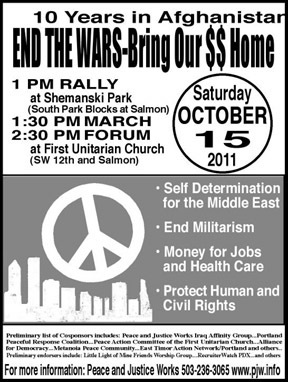 October 15 has also been picked as a day of national action by the United National Antiwar campaign (http://nepajac.org/oct15page1.htm). The themes of economy and war are reflected by many attending the "Occupy Wall Street" events in Portland and around the nation. On October 13, Occupy Portland's General Assembly endorsed the Portland action. The march will stop at SW 4th and Main to address the people at Occupy Portland. As of October 13, 38 peace, social justice, labor, faith, and environmental groups as well as businesses had agreed to cosponsor or endorse the rally, march and forum. Cosponsors of the Portland event include Peace and Justice Works Iraq Affinity Group, Portland Peaceful Response Coalition, the Peace Action Committee of the First Unitarian Church, Alliance for Democracy-Portland Chapter, Metanoia Peace Community, East Timor Action Network/Portland, Oregon Physicians for Social Responsibility, International Socialist Organization , Portland Jobs with Justice, KBOO Community Radio 90.7 FM (media cosponsor), Women's International League for Peace and Freedom-Portland, Tikkun Olam committee of P'nai Or, Americans United for Palestinian Human Rights (AUPHR), Augustana Lutheran Church, Portland Area Rethinking Schools, St. Luke Lutheran Peace and Justice Advocacy Group and American Friends Service Committee. Endorsers include Recruiter Watch PDX, Little Light of Mine Friends Worship Group, Jewish Voice for Peace-Portland, Freedom Socialist Party, Women in Black-Portland, Students United for Palestinian Equal Rights (SUPER), Portland Alliance (media endorser), No War Drum Corps, Oregon Wildlife Federation, Back 2 the WALL, Street Roots (media endorser), Portland Central America Solidarity Committee, Oak Grove Peace Vigil, Progressive Responses--a program of Community Alliance of Lane County (CALC), Tom Dwyer Automotive Services, Buddhist Peace Fellowship-Portland, Flying Focus Video Collective (media endorser), Haymarket Books, Joel Preston Smith Photography, Sisters Of The Road, and Occupy Portland. For more information or for your organization to get involved, contact Peace and Justice Works at 503-236-3065.